Jean Petrona Angus Born February 22, 1923 Summerland, British Columbia. Died April 22, 2013, Vancouver, British Columbia. Jean attended Victoria Normal School to train as a teacher in 1943. She taught school on Salt Spring Island and in Penticton. Her beau was killed service overseas during World War ll. Jean relocated to Toronto to attend the United Church Training School with the intention of serving with the Women's Missionary Service. Jean switched her studies to earn a Bachelor degree from the University of Toronto taking additional additional courses from the United Church Training School (UCTS) at the same time. She also did summer field work with the UCTS until she received her diploma as a Deaconess in 1952. Returning west Jean worked with the Religious Education Council of Alberta. Sarla Bedi née Kapila. Born April 4, 1924,Sahnewal, India. Died November 15, 2013, Toronto, Ontario. Her family moved to British Kenya where they lived in the segregated Indian community. The family could not afford to send Sarla to England to University as she wanted so she became a teacher in Nairobi, Kenya. While teaching she cared for her parents and her brothers. In 1946 she married Gobind Bedi. The couple were married over 60 years and had 4 children. In 1972, seeking to escape unrest in East Africa the family immigrated to Canada and settled in Toronto. In 1976 Sarla became the 1st woman to be registered as an Hindu priest in Ontario. She enjoyed serving her Hindu faith community. She was proud of her new home and new life and refused to move to the U.S.A. with her son in her later years, preferring to stay at home in Toronto. Source: Lives Lived: Sarla Bedi by Nilam Bedi. Globe and Mail May 7, 2014. Suggestion submitted by June Coxon, Ottawa, Ontario. Marguerite Bourgeoys Born April 17, 1620 Troyes, France. Died January 12, 1700. She Came to Canada as a nun to work in the colony of New France. She would founded the Congregation de Notre-Dame de Montreal to encourage young women to work for their community with Devine guidance. The Sisters taught and set up schools in New France. Today the order has several thousand members and has expanded their work to the USA and Japan. Mother Marguerite Bourgeoys was canonized ( declared a Saint in the Roman Catholic Church) in October 1982. Elizabeth Bruyère Born March 19, 1818 L'Assomption, Lower Canada. Died April 5, 1876. In the 1840s Bytown (Now Ottawa) was a rough and tumble timber town with little or no social services and no schools for its large French-Canadian Population. It was Sister Elisabeth who, in 1845, answered the call for service. In 1839 she entered the Sisters of Charity of the Hôpital Général de Montréal. The sisters were commonly known as the Grey Nuns. By March 3, 1845 one of the first bilingual schools in Upper Canada was inaugurated. By May 10 a 10 bed hospital was operating. By June there was organized care for the poor and sick. When an epidemic came in 1847 the services handled over 600 patients and later organized an orphanage to help the some 15 children left destitute. In 1856 the Sisters of Charity of Bytown became independent of the Montreal mother house and by 1876 they had opened some 25 houses to serve in Ontario, Quebec and New York State in the U.S.A.
née Elsie Burnstein. Born September 16, 1900 Frankfurt, Germany. Died March 2, 1988. She took her religious vows in 1923 with the Sisters of Precious Blood. She served her 1st years in The Netherlands. In 1951 she led her order to Canada and founded St Bernard’s Convalescent Hospital in North York, Ontario. In 1958 the hospital went public and Sister Ethelberta served as hospital administrator until she retired in 1982.
née French. Born January 30, 1846, Monivea, Galway, Ireland. Died November 30, 1921. In 1885 she traveled to the Canadian far north Fort McPherson to meet her fiancé, the Rev. Thomas Henry Canham(1852-1947). The famous Riel Rebellion would delay her trip for a whole year. In 1888 the young missionaries were transferred to the area that would become the Yukon Territories. They crossed the rocky mountains by dogsled, open skin boats and barge towed by a river steamer. They would work here in the Yukon for 30 years. The built a schoolhouse in 1892, the oldest known standing structure remaining in Fort Selkirk . Mail came once a year, if weather allowed. The cold was so severe they could not sit for even a meal. Charlotte’s health became poor and the couple eventually retired to Toronto, Ontario. Source: Herstory, the Canadian woman’s Calendar 2008. (Coteau Books, 2007) Suggested reading: Five Pioneer women of the Anglican Church in the Yukon. Anglican Church of Canada Women’s Auxiliary Yukon Diocesan Board, 1964. Ina Caton Born 1914, Toronto, Ontario. Died 2004, Toronto, Ontario. Both her parents died when she was young and she was raised by her uncle and found herself drawn to her Anglican religious community. She trained to become a Deaconess in the church and did mission work in areas of rural Saskatchewan. When attending Synod area meeting she was so shy she asked male colleagues to ask questions or make a point on her behalf. While National Synod passed the idea of accepting women as priests the diocese of Rupert’s Land was not do inclined and refused to ordain women. It was not until 1971 that the path was cleared for Ina to become the 1st woman in Saskatchewan to be ordained as a deacon and 5 years later she was called to the Priesthood. In the early 1980’s she retired to live in Toronto where she as an Honorary Assistant at Little Trinity Anglican Church until her death. Source: Herstory; The Canadian Women’s Calendar 2010. Matilda Moore Churchill née Faulkner. Born October/November 1840, Stewiacke, Nova Scotia. Died August 12, 1924, Toronto, Ontario. Like many of her time she attended Normal School (Teacher’s Collage), Truro, Nova Scotia. She taught locally and was one of the 1st trained graduate teachers at Model School, a high school in Truro. She volunteer teaching the poor Black residence of the area. As a single woman she was discouraged from following her dream to become a foreign missionary. In 1871 a Baptist minister, George Churchill (d 1908) asked her to marry him and accompany him to do missionary work in Asia. She attended the Women’s Medical College, Philadelphia, Pennsylvania, U.S.A. and on September 16, 1873 the couple were married in Truro. They joined a missionary group originally headed for Burma but ended up serving in India. By 1879 the couple had set up their own mission at Bobbili. By 1880 she had established Caste Girl’s School. In 1916 she published with the help of a friend Letters From My Home in India which showed her determination in her missionary life. She remained with her missionary work in India until she retired in February 1921 when she returned to live with her one surviving child, a daughter, in Toronto. Source: Wendy L. Thorpe, “FAULKNER, MATILDA MOORE (Churchill),” in Dictionary of Canadian Biography, vol. 15, University of Toronto/Université Laval, 2003–, accessed February 9, 2016, http://www.biographi.ca/en/bio/faulkner_matilda_moore_15E.html. Born July 11, 1887, Manitoba. Died October 2, 1958, Minto, Yukon. As a young woman she moved to Vancouver, British Columbia where she found office work. She applied and fought to be accepted as an Anglican Church missionary. Single woman were not easily accepted for such positions. In 1916 she moved to Fort Selkirk to teach only to find just two students! In 1929 she married Alexander Coward, a local trader and trapper. She detested the last name so she used the name Cowaret. She traveled to camps tending the sick and as a licensed lay reader to minister to all who would listen. She worked with the local aboriginal population endearing herself to them by learning their language. In 1958 she received a Dominion Life membership in the Anglican Women’s Auxiliary and accompanied Bishop and Mrs. Greenwood to England. She became ill on returning to Canada and went directly to hospital. During her time in Fort Selkirk she made films of the area. These films have been deposited the National Archives of Canada. Source: Five Pioneer Women of the Anglican Church in the Yukon. Anglican Church of Canada, Women’s Auxiliary, Yukon Diocesan Board 1962. Sister Ellen Mary Cullen Born Ellen Mary Monica Cullen . Hope River, Prince Edward Island. May 4, 1898. Died September 29, 1994. Like many young women of her province she attended Prince of Wales College. And became a teacher. By 1921 she heard a call from God and became Sister Frances Loyola of the Congregation of St. Martha of Prince Edward Island. ( later this order would allow members to use given names) At 23 she became Superior General of her convent and was known as Mother Loyola. By 1944 she had returned to school and earned her BSc in home Economics at St. Francis Xavier University, Nova Scotia. She returned to her beloved PEI and became a teacher at Charlottetown Hospital School of Nursing. Once retired she turned her energies to other services for her home area. She served on the provincial and national Canadian Councils for the Aging in 1966 as well as serving on local senior organizations. In retirement she also found time to write and became involved with writing local history including a chapter on the history of the Catholic Church on the Island. The University of Prince Edward Island offers an academic Award in her honour. In 2006 she was awarded the PEI Heritage Award for a book she wrote with Sister Bernice Cullen. Source: Outstanding women of Prince Edward Island Compiled by the Zonta Club of Charlottetown, 1981. Mary Teresa Dease Born May 7, 1820, Dublin, Ireland. Died July 1, 1889. She was sent by her religious order to Canada in 1847. She became Superior-General of the Institute of the Blessed Virgin Mary in America. She was the founder of the Institute in Toronto and later in her position as Superior-General she would oversee its growth in Ontario and New York State. Born Boucherville, New France (Quebec) March 23, 1722. Died June 6, 1792. She was the 1st regular novice to join the Grey Nuns on July 2, 1751. It was her inheritance that allowed the Grey Nuns to purchase the seigneury of Chateauguay. Upon the death of the founding Mother d'Youville, she became the second Mother Superior of the order. Catherine de Hueck Doherty Born Ekaterine Fyodorovna Kolyschkine August 15, 1896 Nizhni Novgorod, Russia. Died December 14, 1985 Combermere, Ontario . She was schooled abroad while her father traveled for work and the family settled in St Petersburg, Russia in 1910 where she attended the Princess Obolensky Academy. At 15 she married her 1st cousin Baron Boris de Hueck. During World War l she was a nurse on the front Lines. After the war the couple escaped the Russian Revolution going 1st to Finland and then to England before landing in Canada. The couple had one son. Divorcing her 1st husband she married again in 1943 to Edward ‘Eddie’ J (1890-1975) Doherty, a well known reporter. By May 17, 1949 the couple moved to Cumbermere to a new rural apostolate they called Madonna House. By 2000 there was a staff of 200 and over 125 associate priests, deacons, and Bishops. Catherine has authored numerous books of religious thought. Born June 7, 1794. Died August 1, 1866. Marie Louise joined the religious order of Saint Elizabeth Congregation of Notre Dame. She was a teacher of repute. In 1849 she became Mother Superior of her order. 27 missions were under her management and she opened five more. Source: Andrée Désilets, “DORVAL, MARIE-LOUISE, Sainte-Elizabeth,” in EN:UNDEF:public_citation_publication, vol. 9, University of Toronto/Université Laval, 2003–, accessed March 20, 2015, http://www.biographi.ca/en/bio/dorval_marie_louise_9E.html. Henrietta Feller née Odin. Born April 22, 1800, Mortaque, Switzerland. Died March 29, 1868, Quebec. Henriette was a staunch believer in helping and serving people. As a youth she visited hospitals to help wherever she could. In 1822 she married Louis Feller a 51 year old widower and became step mother to his children. Her own daughter died at the age of three and shortly after Henriette became a widow. Financed with the monies left to her by her husband Henriette sailed to North America in 1835 and settled in Canada where within a year she established the Feller Institute, a one room school that today is a museum. She was a protestant and was determined to save French – Canadians from the perils of the Catholic Church. There was some set back in the early days of her teaching and she took refuge in the United States for a short period before returning to Quebec to continue her mission to provide protestant education. She founded the French Canadian Protestant mission at Grande-Ligne about 30 miles outside of Montreal. Additional financial resources were raised through the Baptists and 10 protestant churches and several missions were found against the forces of the Catholic Church in Quebec. and the Feller institute would successfully survive until its closure in 1967. Source: René Hardy, “ODIN, HENRIETTE,” in Dictionary of Canadian Biography, vol. 9, University of Toronto/Université Laval, 2003–, accessed January 30, 2015, http://www.biographi.ca/en/bio/odin_henriette_9E.html. Born January 22, 1830. Died October 31, 1874, Montreal, Quebec. . When she entered religious orders she took the name Sister Marie d Bonsecoues. She was the founder and director of the Institution des sourdes-muettes de Montreal. She devoted her life to helping educated deaf and dumb girls. Source: Andrée Désilets, “GADBOIS, ALBINE, Marie de Bonsecours,” in EN:UNDEF:public_citation_publication, vol. 10, University of Toronto/Université Laval, 2003–, accessed March 20, 2015, http://www.biographi.ca/en/bio/gadbois_albine_10E.html. Marie-Eléonore Malvina Gagné Born November 6, 1837 Saint-Michel, Quebec. Died December 29, 1920 Roberval, Quebec. As a young child she often spent time in the summers at her uncle’s farm where she became interested in agriculture. At 15 years of age she was a teacher on Ile d’Orléans. On August 15, 1861 she entered the Ursuline monastery, Quebec City and took the name Mother Saint Raphael. She became a graduate at the normal school (teacher’s college) run by the Ursines. In 1878 she became mistress of novitiate in Chatham, Ontario but was back in Quebec by 1880 preparing for a new mission at Lac-Saint-Jean in 1882. Here, she founded a monastery in Roberval to foster religious training and education of girls in the region. She is credited with establishing the 1st domestic science and agricultural school in the country which prepared young girls to be wives of farmers. The program enabled graduates to take examinations with the Catholic Central Board of Examiners which led to teaching certificates. Mother Rafael dealt with debt and destruction of the convent and school by fire. In 1893 her school was recognized by the government and could now receive financial grants. She worked closely with agronomists of the Department of Agriculture and Colonization and was recognized with the Order of Agricultural Merit in 1892 and 1895. In 1900 she was elected superior of the monastery for six years and began construction of a new boarding school and chapel. After retiring as superior she taught at the school and in 1909 worked to create a new school of household science at Université de Laval. Born March 1, 1818 Montenay, France. Died January 29, 1900 Le Mans, France. In 1841 she worked founding the Marianite Sisters of Holy Cross, Le Mans, France. She was given the name Marie des Sept-Douleurs. In 1843 members of this group were sent to Indiana, U.S.A. and in 1847 to Lower Canada. Marie des Sept-Douleurs became superior general of the Marianite Sisters of Lower Canada and arrived in 1849 where the community consisted of 19 sisters 13 of whom were Canadian. Within ten years there were four convents with boarding facilities for children. However the legal status of the Marianite Sisters remained uncertain. In 1857 Marie des Sept-Douleurs was appointed superior general of the entire congregation of Marianite Sisters of the Holy cross in France, the United States and Lower Canada. She was recalled to the mother house in Le Mans in 1863. In 1867 the Marianite Sisters received approval of the Holy See (high government of the church). On December 3, 1882 the Canadian sisters set up a new religious congregation of their own as Sisters of the Holy Cross and Sept Douleurs. Marie Angèle Gauthier Born February 9, 1828. Died May 25, 1898. A hardworking farmer's daughter she joined the order of the Sisters of St Anne as Sister Marie Angèle. She traveled as one of the first group of religious orders of women to open schools on Vancouver Island. The adventures of her trip to Victoria, British Columbia, were published in 1859. Perhaps more of a legacy than her writings was her teaching. She taught native children many skills including knitting. This skill would be used in Duncan B.C. to make the famous Cowichan sweaters. Philomene Gendron Born July 17, 1840, Sainte-Rosalie, Upper Canada (Now Ontario). Died October 20, 1921, Montreal, Quebec. On February 9 1863 she entered into religious life with the Religious Hospitallers of St Joseph at Hôtel-Dieu in Montreal. On July 8, 1865 she took her formal vows. From 1871-1881 she served as Bursar to the Hospital and later as bursar for her religious community. In 1888 she was appointed Superior of a mission in Campbelton, New Brunswick. She and two sisters arrived August 13, 1888 to teach and to run a hospital. By October 1888 they had 50 students and their 1st hospital patient. The conditions were primitive and very cold. Sister Gendron worked to plan new accommodations which came two years later. She served as mistress to novices until 1897 when she move back to Montreal to serve as Chief Hospitaller. In 1900 she returned to Campbelton as Superior and Administrator. In 1905 expansion was past due and she began working on plans for a new hospital which would be opened in 1909. In 1906 she returned to Montreal and once again served as Bursar. Source; Corinne LaPlante, “GENDRON, PHILOMÈNE,” in EN:UNDEF:public_citation_publication, vol. 15, University of Toronto/Université Laval, 2003–, accessed February 10, 2016, http://www.biographi.ca/en/bio/gendron_philomene_15E.html. Lydia Emélie Gruchy Born September 5, 1894, Paris, France Died April 9, 1992 White Rock, British Columbia. After the death of Lydia's mother when she was just eight years old, Lydia and her sisters were sent to boarding school. After completing a grade 12 business course Lydia worked in the British civil service in 1913. It was that year that her father and her sisters immigrated to Saskatchewan where 4 of her brothers had settled. Her brother was studying for the ministry when he was killed in World War l. Lydia had earned a teaching certificate and was teaching when she decided to continue her education receiving a BA from the University of Saskatchewan. She decided to study for the ministry graduating in 1923 with top honours from the Presbyterian Theology Collage (now St Andrew's College), Saskatoon. She worked as a minister's assistant and a lay practitioner as women were not allowed to be full ministers. In 1926 she requested ordination and was refused. She would repeat her request every two years. Once the United Church decided to allow female ministers, Lydia was ordained at St Andrew's Church, Moose Jaw, Saskatchewan on November 4, 1936, becoming the 1st woman in Canada to be a minister in the United Church of Canada. In 1953 she became the 1st woman to receive a Doctor of Divinity from St Andrews College. She continued her work in the church until she retired in 1962. In 1994 St Andrews College dedicated a commemorative plaque in her honour. 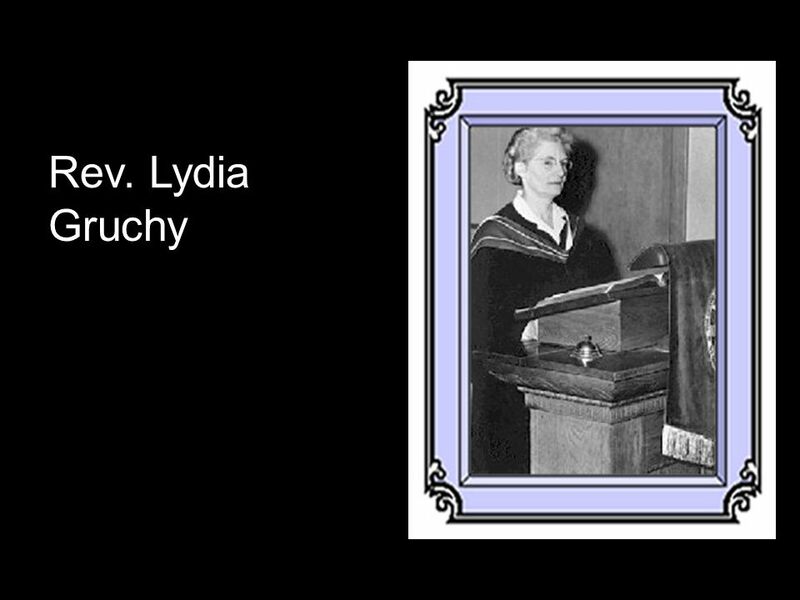 in 1996 on the 60th anniversary of the ordination of women in the United Church St Andrews College established the Lydia Gruchy chair of Pastoral Theology in her honour. In 2003 St Andrews United Church, Moose Jaw, Saskatchewan named a chapel in her honour. Lydia Elizabeth 'Eliza' or 'Lyda' Hall Born 1864 Eramosa Township, Upper Canada. (Now Ontario). Died May 15, 1916, Guelph, Ontario. After the death of her father her mother married George Wigglesworth and the family first settled in Georgetown and then finally in Guelph. Lydia and her sister Margaret worked as milliners. In April 1885 an evangelist the Reverend David Savage at the family’s Methodist Church and Lydia became a follower. In 1886 she worked with him on one of his religious teams and in 1887 she and Sarah (Sadie) Williams of Tottenham worked as a team. When Sadie left to go out on her own Lyda Sister Anne ‘Annie’ Jane Hall joined to form an evangelistic team. According to written newspaper accounts Lydia was a gifted preacher, earnest and intelligent. As their reputation grew the sisters were working with a strenuous schedule. In the spring of 1895 they were invited to conduct services in their home congregation in Guelph. The Methodist Church of Canada did not ordain women to its ministry so evangelists like Lyda had no official status. They were invited by ministers to come and help with services. The sisters worked together until 1907 when Lyda was stricken with paralysis. Annie remained home helping with her sister’s care. At the end of the 19th century and the beginning of the 20th century a handful of lady evangelists such as Lyda and Annie labored to bring the word to the people and left a mark on the hearts of the people. Source: Dictionary of Canadian Biography. Accessed online 2002. Sr. Mary Benedicta Born August 15, 1845 Chatham, New Brunswick. Died February 12, 1895, Halifax, Nova Scotia. She entered the congregation of the Sisters of Charity, Halifax, Nova Scotia on March 19, 1865 and in June of that year she took the name of Sister Mary Benedicta. In 1867 she too her 1st teaching assignment in the north end of Halifax. In the fall of 1870 she returned to a small convent in St Joseph’s parish where she came into close contact with orphan children and she experienced the work that was her greatest love. In 1878 she was at St Anne’s Convent at Eel Brook> It was a dark time with the convent facing persecution of a local pastor. The final decision came in favour of the convent in 1880 from Rome and in June 1881 Mary Benedicta became mother superior. She opened new missions in Nova Scotia and took steps to pen St Patrick’s Girls High School in Halifax in 1884. By 1894 her health was frail. Source: Dictionary of Canadian Biography Vol. 12. Accessed December 2001. Barbara Heck née Ruckle. Born 1734, Ballingrane, Ireland 1734. Died August 17, 1804 Augusta, Upper Canada (Ontario). The Ruckle family were members of a community of German refugees known as the Palatines who settled in Ireland in 1709. Barbara married Paul Heck in Ireland in 1760. The couple would have 7 children. She and her husband originally emigrated to the colony of New York in 1760 where she was paramount in establishing the new Methodist religion, including organizing the First Methodist Church in New York City. Loyalists in the American Revolution the family fled to the sanctuary of the colonies in Canada where once again Mrs. Heck worked to establishing the foundations of her Methodist church in the Bay of Quinte area of Upper Canada (Ontario) and is considered a founder of the Methodist church in Canada. Source: Dictionary of Canadian Biography. .
Born August 19, 1910, China. Died April 24, 1993. Katherine was raised for her early childhood in China where her parents were missionaries. She returned to Canada for her higher education. She earned her BA in 1934 and went on to earn her MA, her degree in education and then earned a Bachelor of Divinity as well as a PhD in divinity. She was one of the 1st female students at Emmanuel College in Toronto. She was sponsored by the Women’s Missionary Society of the United Church to study for her doctorate in theology in India. She served as Dean of Studies and Librarian at the Canadian School for Missions and Ecumenical Institute. She wrote Servants of God in People’s China in 1962. Her portrait hangs in the Memorial Room of Trinity St Paul’s United Church on Bloor St., Toronto and the lane that runs behind this church has been named in her honour. Sources: Lois M. Wilson, I want to be in that number: Cool Saints I Have Known, Published by the author, 2014. ; Mary Rose Donnelly, Katherine: Katherine Boehner Hockin, a Biography, Winfield, B.C. ; Wood Lake Books, 1992. Norah Louise Hughes Born 1905, Portsmouth, England. Died July 28, 1989 British Columbia. In 1921 she and her family immigrated to Canada and settled in Abbotsford area of British Columbia. Norah attended the University of British Columbia where she earned and Bachelor of Science degree in Microbiology. In 1937 she became a candidate for the ministry in the United Church of Canada. In 1940 she earned a Bachelor of Divinity degree from Union College and went on to earn her PhD from the University of Chicago in the U.S.A. In 1962 she was elected as the 1st woman to be head of a Conference in the United Church representing the geographical area of British Columbia. Source: British Columbia Conference of the United Church of Canada. Rev. Dr. Norah Louise Hughes Accessed February 20 2017. Born April 30, 1791, Québec. Died January 7, 1869. She answered the calling to become a nun in the order of the Congregation of Norte Dame in September 1809 . She would be appointed as the Superior of the order three times at a time of great expansion for the order itself. The order held education in high regard and expanded the knowledge of teaching. The sisters were well known as well trained teachers at a time when education of teachers was not strong nor a priority of the community. Suggested resource: The Dictionary of Canadian Biography (Toronto; University of Toronto ) Volume IX Pg 402-403. Marie-Rosalie Cadron Jetté Born January 27, 1794 Lavaltrie, Lower Canada. Died April 5, 1864 Montreal, Canada East. On October 7, 1811 she married Jean Marie Jetté (died 1832). The couple had 11 children. As a widow Rosalie opened her home in Montreal as a refuge for unwed mothers, a cause well ahead of her time. In the spring or 1845 she went against her children's wishes and moved to a small house on Rue Saint-Simon to continue her charity work. On January 16, 1848 she and her colleagues made their religious profession and she became Sister Marie of the Nativity, the widow Jetté. She preferred to work in the background refusing all positions of authority. She received penitents, cared for new born babies and attended the sick. During her life of service to the community she provided a safe haven for 2,300 unwed mothers. Source; DCB. Jeanne Le Ber Born Montreal, Quebec January 4, 1662. Died October 3, 1714. As a young girl she had a dowry of 50,000 écrus and was the most eligible girl in New France. However, Jeanne decided to live a secluded life for 5 years. On the 24 of June 1685 she took a vow of perpetual seclusion, chastity, and poverty. Because of her social rank she retained an attendant. She gave large financial assistance to the building of a new church and a three floor apartment directly behind the alter became her living quarters. She has been studied and her life used as a character in a modern mystery novel Death du jour.(1998). Marie de l'Incarnation. Marie Guyant. Born Tours, France October 28, 1599. Died April 30, 1672. She read about Canada in the famous Jesuit Relations and decided it was the place for her. She would arrive in 1639 and found the Ursuline Order of Canada. She became an expert in several native languages and translated several religious books for her native students. Born 1811, Ireland. Died October 27, 1870. Sister Mary Basilia of the Sisters of Charity arrived in Halifax in 1849to open the St Mary’s Girls School with 200 girls registered for free education. In 1850 the Board of School Commissions for the area recorded 500 students at the School. Sister Mary Basilia was also concerned with the adult illiteracy rate and established night classes for adults. At the same time she also cared for 20 orphans of immigrants who had died of ship fever during the strenuous ocean crossing. By 1854 St Mary’s Orphan Asylum had 16 youth under its care. She would become the first Mother Superior of the Canadian headquarters of the Sisters of Charity which was the only English speaking congregation of religious sisters in Canada. Today over 1400 sisters continue to serve across Canada. Source: Dictionary of Canadian Biography Vol. X p 476-77. Teresa Margaret McDonnell Born February 29, 1835. Died November 4, 1917 St Boniface, Manitoba. Her mother died when she was an infant and she was brought up by her father and her and in St Andrew, Ontario. Her father took her to the Grey nuns in Ottawa so she would have an education. On January 31, 1851 she took her vows becoming Sister Therese. In 1855 she was serving in St Boniface, Manitoba in the area of the Red River Settlement. She became the pharmacist visiting the sick in the huts and teepees and was equivalent to a country doctor known as Sueur Doctor. In 1859 she was recalled to Ottawa but on the trip back she was kidnapped by some of her loyal followers and she returned to St Boniface where she was reinstalled. On August 5, 1871, with Sister Royal Sister Therese installed beds on the top floor of the laundry area to help the sick. By 1877 a regular hospital was established and St Boniface General hospital had its roots. She also founded St Mary's Academy. Marie Louise McLoughlin Born August 28, 1780. Died July 4, 1846.. When Marie-Louise entered the Ursuline order of nuns she took the name Sister de Saint Henri. She was a teacher in the order and became Mother superior. She was in fact a teacher ahead of her time. She established written teaching regulations which were the 1st of their kind for the order. Source: Suzanne Prince, “McLOUGHLIN, MARIE-LOUISE, de Saint-Henri,” in EN:UNDEF:public_citation_publication, vol. 7, University of Toronto/Université Laval, 2003–, accessed March 20, 2015, http://www.biographi.ca/en/bio/mcloughlin_marie_louise_7E.html. Mother Marie-Rose. Elalie Durocher. Born October 6, 1811. Died October 6, 1849. She was the founder of a local community of the Sisters of the Holy Name of Jesus and Mary which is a teaching order that served in rural Lower Canada (now Quebec) In 1982 Pope John Paul II Beatified Mother Marie-Rose, one of the steps to having someone declared a Saint. Born August 1781, Ireland. Died October 8, 1865, Saint John’s, Newfoundland. In 1825 Belinda became Sister Mary Xavier of the Presentation of the Blessed Virgin Mary in Galway, Ireland. In 1833 she and for other sisters, were the 1st nuns to arrive in Newfoundland. The sisters had as a goal to open a school for orphan and poor girls. By 1844 the school had grown from 950 students to 1200 girls. Later boys would be allowed to attend classes as well. In December 1844 a convent was build for the school but was destroyed by a fie in June 1846. In 1850 a new convent and school was opened in Cathedral Square, Saint John’s. In 1853 Sister Mary Xavier was appointed Superior of the convent of Harbour Main. Source: Barbara J. Eddy, “MOLONY, BELINDA,” in Dictionary of Canadian Biography, vol. 9, University of Toronto/Université Laval, 2003–, accessed January 30, 2015, http://www.biographi.ca/en/bio/molony_belinda_9E.html. Marie Morin. Born March 19, 1649 Quebec City, New France. . Buried April 8,1730 Montreal, New France (Now Quebec). At the age of 13 she became an novitiate of a convent in Montreal. She took her vows as a nun with the Religious Hospitallers of Ville, Marie, Montreal. on October 27, 1671. She was the 1st Canadian born woman to become a religious sister. She would become bursar and superior of the Hospitalièrs of Montreal. In 1693 through 1698 she was the 1st Canadian born superior of the Hôtel-Dieu de Montréal. Sister Morin oversaw the rebuilding of the Hotel Dieu beginning in 1689 and again when the new structure burned on February 24 1695. She served a second time as superior of her order from 1708 to 1711. She was also one of the 1st women writers in New France. She wrote the annals of the Hotel Dieu (1697-1725) and her own memoirs. She was a heroic woman, a true product of the early days of New France. Aimee Semple McPherson. née Kennedy. Born October 9, 1890 Ingersoll, Ontario. Died September 27, 1944. She was an evangelist. She opened, in the U.S.A., the Angelus Temple of the Four Square Gospel for 1.25 million dollars! That was a lot of money in 1918! In her day, she was the most publicized revivalist in the world. Mother Marie Anne Paquet Born Quebec September 27, 1755. Died January 25, 1831. She took the name de Saint Olivier when she entered the novitiate of the Ursuline sisters on March 12, 1772. She would serve three terms as Superior. During one of her terms an 1806 fire destroyed the convent. She remained on site until she had gained enough support to have the convent rebuild. During her tenure the sisters opened boarding schools, day schools and hospitals for the insane. They also expanded to Boston and New Orleans in the United States. Mother Marie-Léone (Elodie) Paradis Born May 12, 1849 L'Acadie, Lower Canada. Died May 3, 1912. In 1854, at the age of 14 she presented herself at a convent near Montreal. In August 1857 she took her vows under the name of Sister Marie-de-Saint-Léon. She served in Quebec, New York and Michigan before finding herself in Acadia where in 1874 she was chosen to direct a group of novices in New Brunswick. The Holy Cross Fathers in the region were desperate for help to educate the Acadians of the region. They could not afford to pay lay teachers. This energetic and devoted woman is credited with infusing energies and saving the Acadian culture in the region. Returning to Quebec in 1895 she sought support and recognition for her order of Little Sisters of the Holy Family, which would help priest with educational needs. . Official recognition came in 1896. Elodie Paradis was beatified in Montreal on September 11, 1984, the first to be done on Canadian soil by Pope John Paul ll during his Canadian visit. Mother Joseph (Esther) Pariseau Born Saint-Martin (Laval) Lower Canada (Quebec) April 16, 1823. Died January 1902. In December 1843 she entered the Sisters of Providence in Montreal and volunteered with for others to be a missionary in the Washington and Canada western territories. She would be the power behind the establishment of some 10 schools, 2 orphanages, 15 hospitals, an asylum and home for the aged. In 1866 she was in charge of building and financing missions in the Canadian and American West. She would set on on "begging tours" in the Canadian and American west to finance the institutions that the order would build. Because of her contribution in designing and building institutions she is considered to be one of the first architects in the northwest and is also recognized as an early artisan who used native northwest woods. The state of Washington gave her national prominence in 1980 when her statue was placed in Statuary Hall in Washington D.C., as an historic leader of Washington State. She is the fifth woman and the first Catholic sister represented in the United States gallery of "first citizens." Sister Marguerite-Marie of Alacoque. Born October 11, 1848 Red River, Manitoba. . Died December 27, 1883. She is perhaps best known for being the sister of Métis Leader Louis Riel (1844-1995). As a youth she was educated by the Sisters of Charity in St. Boniface, Manitoba.. She took her vows as a nun in 1868 the 1st Métis of Red River to become a nun. . As a Grey Nun she taught at the sisters boarding school and then became a missionary. With the area active with rebellion in 1869 Sister Sara Riel was moved several time for her protection. In 1871 she became the 1st Métis missionary for Red River to serve at Ile-a-la-Cross in Northern Saskatchewan. In 1872, After a vision, she took the name of Sister Marguerite-Marie of Alacoque. The Grey Nuns of Manitoba Created the Sara Riel Inc., a charitable organization offering a variety of mental health services to adults. Anne Marguerite Squire nee Park. Born October 17, 1920 Amherstburg, Ontario. Died April 24, 2017 Ottawa, Ontario. Anne taught school prior to marring Bill Squire ( _2016) in 1943. The couple had 3 daughters. In 1972 she received the Carleton University Senate Medal. In 1975 she earned her Master’s in religion from Carleton University, Ottawa and taught Religious Studies and Womens’ Studies programs. In 1977 through 1980 she was appointed as Chair of Project Ministry striving for a ministry of the whole people. From 1980 for 5 years she provided leadership at Queen’s Theological College serving on the Board of Managers. In 1982 she became secretary of the United Church Division of Ministry and Personnel and Education. And Chair of the Interchurch/Interfaith Committee from 1988 through 1992. In 1985 she received her Doctor of Divinity from Queen’s University, Kingston, Ontario. In 1986 she became the 1st woman lay Moderator elected to the highest position in the United Church of Canada serving through 1988. During her term as Moderator she took the brunt negative feedback when she announced that gay and lesbian people were eligible to be ordained and commissioned ministers. From 1993 to 1998 she chaired the Service Advisory Committee of the Ottawa Carleton Palliative Care Association . Anne was also a founding member of the Ottawa Muslim/Christian Dialogue Group and a staunch patron of the Multifaith Housing Initiative. In 2005 she was still an advocate for equality of marriages and expressed her views to an Ottawa legislative committee. She represented the United Church of Canada as a witness in the Truth and Reconciliation Commission proceedings. Florence Storgoff Born 1908, Canora, Saskatchewan. Died September 11, 1964. She married and moved a bride to a Doukabor Colony In British Columbia. The Doukabor's were a religions sect who believe in a form of communal living and whose founders in Canada had emigrated from persecution in Russia. Storgoff became an active religious protestor against what she perceived as offensive government regulations. Both she and her husband were sent to a special Doukabor living compound on Pier's Island near Victoria, British Columbia. The Canadian government had set up the living compound as a result of the Doukabor protests which were considered a danger not only to the group themselves but to the Canadian public in general. Florence soon became an acknowledged leader of the Sons of Freedom Doukabor group. For what she believed to be her religious beliefs, she would be arrested, charged and sentenced and spend three years in the Kingston penitentiary for women for arson. In 1963 she led some 900 followers to the Lower British Columbia mainland. 400 of the protestors camped out at Agassiz Mountain Prison, protesting the arrest of fellow Doukabors. Born 1656 Ossemenon (now Auriesville, New York U.S.A.) . Died April 17, 1680. She was Baptized in the Roman Catholic Church as Catherine. Her family died during a smallpox epidemic in 1661-1663 and her face was left scared and feeble sighted. During her life with remaining family She refused to marry and finally the women of the tribe gave up on finding her a husband. At nineteen she embraced the Catholic religion on Easter Sunday April 18, 1676. Kateri was the Mohawk form of Catherine. The following year she relocated a Jesuit mission , Kahnawake south of Montreal, New France. Priests of the area described her as being extremely pious and of course wrote of her virginity. Kateri believed in the value of offered suffering. She ate very little and lie upon a mat with thorns. She joined with a group of other young women to practice their faith. She burned herself in penance. Upon her death it was written that her smallpox scares disappeared and she became beautiful. Weeks after her death she purportedly appeared to three people including a priest. A chapel was built near her grave and by 1684 pilgrimages to the site had begun. She was the 4th Native American to be venerated in the Roman Catholic Church and the 1st to be canonized (to become a saint) on October 21, 2012. A statue of Tekawitha is installed outside the Basilica of Sainte-Anne-de-Beaupré in Quebec, Canada. Another is installed at the Cathedral Basilica of St. Francis of Assisi in Santa Fe, New Mexico. Since these 1st statues many more have appeared in religious structure through out North America. Miracles of healing have been attributed to Kateri aiding her veneration. Several churches and many schools have been named in her honour through out North America. Florence Li Tim-Oi Born Hong Kong May 5, 1907. Died February 6, 1992. She began her ministry with the Anglican Church in Hong Kong. In 1944 she became the 1st woman to be ordained in the Anglican communion. Although there was support for her in her own diocese there was great pressure and protest against her ministry. She relinquished the title and role of priest. For the next 39 years she continued to serve without any bitterness to her church. In 1983 she immigrated to Canada and was appointed an honourary assistant at St John's Chinese congregation in St Mathew's parish in Toronto. Times had changed and the Anglican Church of Canada of the mid 1980's now approved the ordination of women. In 1984, after a 40 year gap in time, Florence was reinstated as a priest in her church. The university of Waterloo has created the Florence Li Tim-Oi Memorial Award for students in social work with the elderly. The University will ope a Resource Centre and Archives in her name to house her personal archives. Sister Saint Jean-de-Goto Born July 27, 1845, Boucherville, Lower Canada (now Quebec). Died May 8, 1906, Arthabaska, Quebec. After being educated at a convent on September 8, 1860 this teenager joined the Religious Hospitallers of St Joseph at the Hôtel-Dieu in Montreal, Quebec. On February 3, 1863 she took her final vows and accepted the name Sister Saint-Jean-de-Goto. When she was 23 she was part of a group of 6 she went to Tracaidie to work with lepers. Here she set up a pharmacy. In 1875 she was elected Superior of Tracaidie. Although there was no formal demand for a school the sisters taught orphans in the surrounding area. Sister Saint-Jean-de-Goto began collecting funds and in 1898 an orphanage and hospital was completed. In 1899 she had completed her 5th term as Superior at Tracaidie and she would leave a strong foundation for her order with Acadian sisters she had trained. In 1902 she was elected Superior of Hôtel-Dieu at Arthabaskaville, Quebec where she strived to have built a new 5 story wing before her death. Source: Corinne La Plante, “VIGER, AMANDA, named Saint-Jean-de-Goto,” in Dictionary of Canadian Biography, vol. 13, University of Toronto/Université Laval, 2003–, accessed February 11, 2016, http://www.biographi.ca/en/bio/viger_amanda_13E.html. Esther Wheelwright Born Wells Massachusetts (now Maine), U.S.A. April 10, 1696. Died November 28, 1780. Born to a Congregationalist protestant family, she would be re-baptized as Marie-Joseph dite L'Enfant-Jésus when she became a nun in Quebec. She was kidnapped by the Indian allies of the French who were at war against the British. The French missionaries introduced her to the Catholic Faith. Her family tried to obtain her return home but there were too many barriers and the girl was placed in a school run by the Ursuline Sisters. She decided to become an nun and refused to return to her home. She would become the Mother Superior and maintain good relations between the Ursuline and the new British authorities after the fall of Quebec. She helped her religious community to become strong through 20 of its most difficult years. Lois Miriam Wilson née Freeman. Born April 8, 1927, Winnipeg, Manitoba. After 15 years as a homemaker she became an ordained minister in the United Church of Canada. In 1976 she became first woman president of the Canadian Council of Churches, and in 1980 she was appointed the first woman to the top position of Moderator of the United Church. She is a member of the Order of Canada and has received the Pearson Peace Prize and the World Federalist Peace Award. Marie Marguerite d'Youville née Dufrost de Lajemerais. Born October 15, 1701,Varennes, Quebec. Died December 23, 1771. She was a daughter of one of the great families of New France. She was married in 1712, she was the mother of two children, and became . widowed in 1730. By 1742 both sons had become priests and Marguerite worked to ease the plight of the poor. She was joined by other women and their work extended to the running of the Hôpital Générale. The group of tireless workers would eventually become a religious order known as the Grey Nuns. Marguerite was described as a remarkable woman who was courageous and processed remarkable administrative talent.